uuid : 8f0b1de4-2d54-41f8-a739-6d36ea7327bd templates_id: 119499 templates_uuid: "6c0726ea-b155-4e60-a646-0163550e8107" title: "Partnership Agreement Template - Create a Partnership Agreement Online" display_name: "Partnership agreement" meta_keywords: "Business partnership agreement, Partnership contract and Articles of partnership" description: "
Make sure your business runs smoothly when you enter into a partnership agreement with one or more individuals with this partnership agreement template. Avoid potential conflict by drafting a detailed and complete agreement of what is expected of the partners and how the business will be run under the new partnership. This partnership agreement covers who the partners are, their capital contributions, their rights and responsibilities, and what will happen if and when they decide to leave the partnership. A partnership agreement is used when two or more partners engage in a business with a view to making a profit. It sets out each partner\302\222s rights and responsibilities, provisions for running the business day-to-day and what happens if a partner dies or the partnership dissolves. Do I need a partnership agreement? A partnership agreement sets out how your business will prepare for common business scenarios, plan how a partner may leave, or handle disproportionate partnership contributions. Setting up clear business expectations will help partners avoid future misunderstandings. Other terms may include buy-out options and how the partnership can be dissolved. A partnership is a relationship between two or more \302\221partners\302\222 carrying out a business with a view to making a profit. A partnership, unlike a company, is not a separate legal entity. Could a company be a partner in a partnership? Partners can be individuals, companies and limited liability partnerships (LLP). A partnership can maintain a single partnership capital account for all the partners. However, it is easier to maintain separate capital accounts within the accounting system for each partner as in the event of a liquidation of the business or a departure of a partner it is easier to determine the amount of payments and liabilities for each partner. Also, partners cannot withdraw any capital money from the account while in partnership unless they have a written consent of all of the partners. Each partner of the partnership a current account. Each partner\'s share of any profit will be credited to this account. Any share of loss, withdrawals by the partner or tax payments will be debited from the current account. How are profits attributed and losses accounted for? The partners will share the profit and bear any losses for any partnership for any partnership year, eg each period of 12 months ending on the accounting reference day or any other period determined by partners. An accounting period is usually a 12 month period for which the partnership has to prepare accounts. How can partners exit the partnership? by involuntary retiring. This applies if a partner dies or or if the partners require them to retire as a partner as they have not been able to perform his duties for a long period. by written notice of expulsion. A partner can be expelled from a partnership for:serious breaches of the partnership agreement; if a bankruptcy order is made against them; if they have failed to pay money owed to the partnership within 10 business days or if they no longer hold a necessary professional qualification. What obligations are imposed on partners that leave? \r\n(if specified in the agreement) may not solicit customers, entice away employees or engage in competing business. Am I personally liable for paying my taxes as a partner? Yes, partners who are individuals pay Income Tax and National Insurance through Self Assessment. If a partner is a company, it must be registered with HMRC for Corporation Tax. This partnership agreement is governed by the law of England and Wales.
" created_timestamp: "2018-10-08 04:36:26.0" modified_timestamp: "2018-10-08 04:36:26.0" active: true created_by: 102 modified_by: 102 dcm_id: 277 url_slug: "Partnership-agreement" meta_description: "Print or download a free Partnership Agreement online when you and another individual want to carry on a business in partnership with each other. 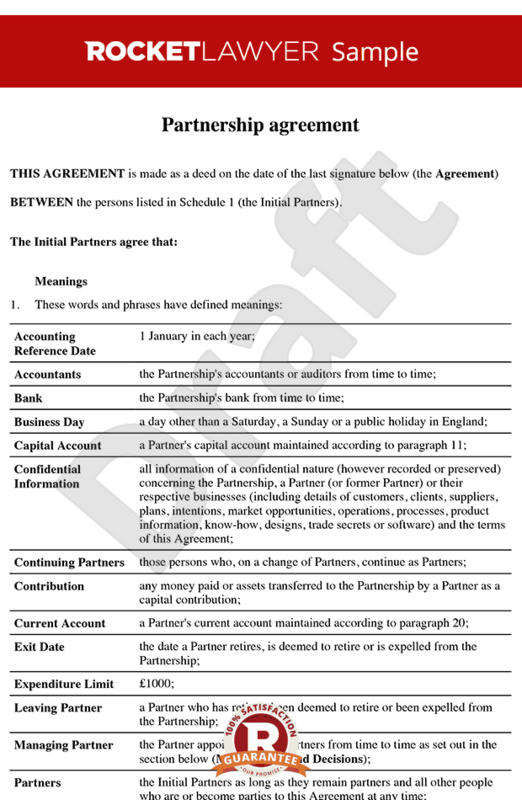 Set out the important details of your business partnership in this partnership agreement template UK." time_to_complete: "20 minutes"
A partnership agreement is used when two or more partners engage in a business with a view to making a profit. It sets out each partners rights and responsibilities, provisions for running the business day-to-day and what happens if a partner dies or the partnership dissolves. A partnership is a relationship between two or more partners carrying out a business with a view to making a profit. A partnership, unlike a company, is not a separate legal entity. Each partner of the partnership a current account. Each partner's share of any profit will be credited to this account. Any share of loss, withdrawals by the partner or tax payments will be debited from the current account. (if specified in the agreement) may not solicit customers, entice away employees or engage in competing business. More than just a Partnership agreement template, our step-by-step interview and guidance makes it easy to create your document. Easily create online, download, print and sign your free Partnership agreement in minutes. This document is also sometimes called: Business partnership agreement, Partnership contract and Articles of partnership.